Abby Freeman posing in her uniform. Media by Brittany Lopez. The Greenville University Women’s Volleyball team has had a reputation for success over the previous years. Head coach, Tom Ackerman has successfully shown his desire to win and his commitment to bringing in top-notch skill and talent to the program. Abby Freeman, a 5’9 Sophomore from Chicago, Illinois is a prime example. The young star is extremely athletic and competitive. As a freshman last season, she played a total of 101 sets and put up 251 kills along with 55 blocks. As the team’s returning outside hitter, she has already racked up 28 sets, 107 kills, and 21 blocks within 8 matches. After such a dominant performance last week, she was named SLIAC volleyball offensive player of the week. This past Tuesday night, the Panthers took on Illinois College in which Freeman continued to show why she deserved the honor of being named the offensive player of the week. Freeman recorded 19 kills, and 3 solo blocks as the women’s volleyball team was able to extend their winning streak. Freeman is excited and absolutely can’t wait to see how far they can take the program this year. Freeman expresses how the game of volleyball has come pretty naturally to her as she has also had experience with other sports such as soccer, dance, ice-skating, and swimming. 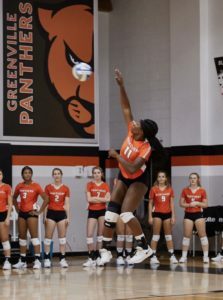 She admitted that when she first started playing volleyball in the 6th grade, she originally thought the idea of the game was to hit the ball into the ceiling, but quickly realized she was wrong. While being blessed with the opportunity to play volleyball, she has been able to meet so many of her closest friends. Freeman has made so many memories while also being able to learn some important aspects of playing on a team. For instance, since volleyball isn’t an individual sport, the game has taught her about having leadership skills and working hard. Freeman for the kill. Media by Darrin Stewart. Freeman chose to dedicate herself to volleyball because she absolutely loves the grit that you have to have to play this game. She believes that there is no better feeling than winning games with some of her best friends. There is nothing like getting that game-winning kill or block. Volleyball has had such a positive impact on Freeman and she strongly recognizes that this game has played a huge part in her life. She hopes to one day play at the Olympic level or even professionally overseas. However, as she is currently going to school for a Psychology degree in hopes to become a Pediatrician or Behavioral Analysts in the FBI. Freeman for the ace. Media by Darrin Stewart. Freeman is beyond grateful for the support she has from coaches, family members, and close friends and can’t thank those people enough. This support system of hers has helped shape her into the individual and player she stands as today. From the whole staff at Ultimate VBC in Frankfort, Illinois to her own mother and Aunt Nette who have been present since day one of volleyball. 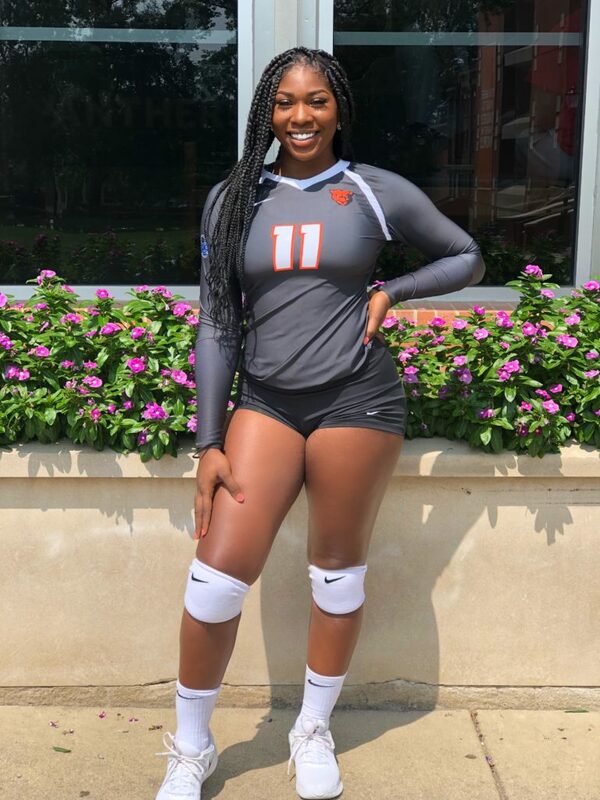 Her mother has literally paid the price and has been willing to put thousands of dollars into Freemans’s volleyball career to send her to the best USA camps/ training and clinics to compete at the highest level. She is also so appreciative of head coach Ackerman and assistant coach Hayle Gibson for all they have done for her in the past year. She has never experienced coaches so invested and dedicated to their players, not just on the court but also in every aspect of life. They are the true definition of respect and kindness which played a huge part in Freemans’s decision to come to Greenville. 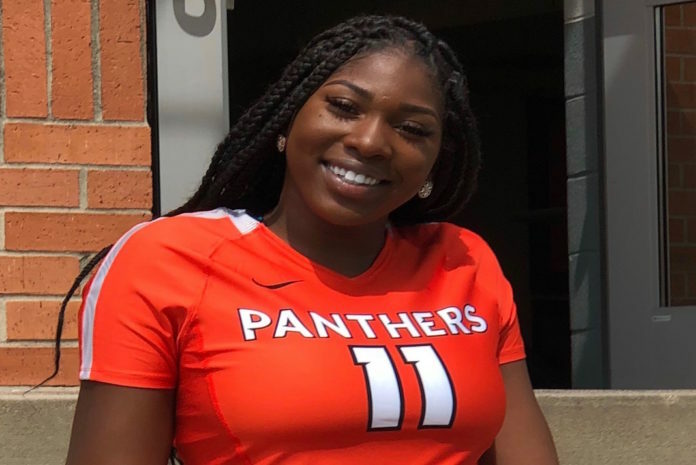 Although many of us may recognize Freeman as an amazing volleyball player, it’s also important to realize that there is more to her than that. As she is a very familiar face around campus, her outgoing personality and love for others shouldn’t go unnoticed. Being a student-athlete can be very difficult to manage but Freeman’s ability to dominate on the court and in the classroom is truly remarkable. Her contribution to the women’s volleyball team so far has been something incredible to watch and to only imagine what she will do in the next 2 years makes many of us that much more adrenalized! Stay tuned for more on the Women’s Volleyball Season. Thank you! I appreciate you taking the time out of your day to read it!! Great write up Brittany!! Hugs from the Leyva Family in AZ!! Great article young lady keep up the good work God has a great plan for you. Great article young lady keep up the good work God has a plan for you. He most certainly does. Blessings to you and the rest of the family back home! Everyone is in my prayers.